As always, we continue to monitor Rave & Rehab projects for opportunities to improve multi-modal safety. 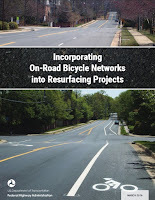 Not long ago, we asked for and succeeded in getting bike pocket lanes on Elkton Rd (between Newark and the MD line) with an interim project. We continue to ask for shared right turn-only lane treatments on roads such as Route 72/Sunset Lake Rd south of Newark, and believe DelDOT will come through for us next time it is resurfaced. Each year, more and more opportunities arise, within the confines of what can be achieved with a basic Pave & Rehab project (beyond that, it becomes capital reconstruction) and re-striping. It is up to road safety advocates to take the lead on this, since Delaware's LAB sanctioned advocacy org has never once taken an interest. 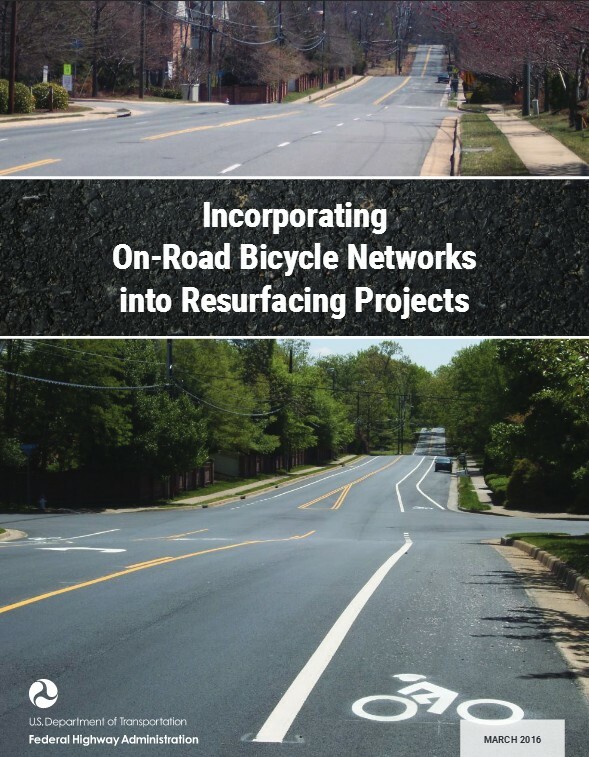 According to Mark Luszcz, our Chief Traffic Engineer, DelDOT is closely aligned with the Federal Highway Department's recommendations as found in the manual Incorporating on-road bicycle facilities and safety treatments during repave/rehab projects. 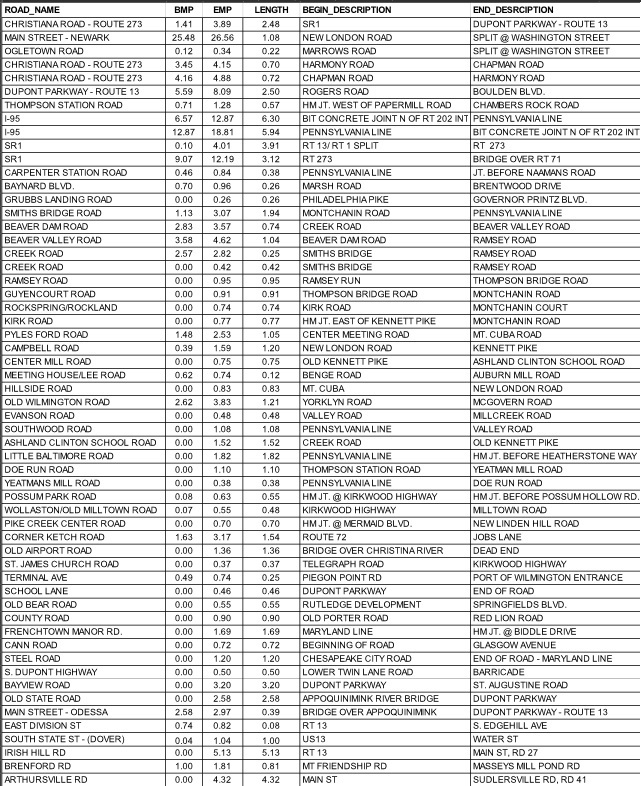 It is by far the most bang for the buck, as roads and shoulders are re-striped regardless. Combined with a Pave & Rehab project, it comes out much less expensive because a little added paint is the primary cost. On the other hand, bike paths cost vastly more to build and maintain. In an October 2013 article, we revealed the spending of nearly $2M to complete a 1/4 mile section of the Northern Delaware Greenway along Talley Road. A protected bike lane could have served a similar purpose at a small fraction of the cost. "Squint at Stevenage’s extensive 1960s protected cycleway network and you could be in the Netherlands – except for the lack of people on bikes. So why did the New Town’s residents choose the motor car over the bicycle? The town, 30 miles north of London, had wide, smooth cycleways next to its main roads which were separated from cars and pedestrians. There were well-lit, airy underpasses beneath roundabouts, and schools, workplaces and shops were all linked by protected cycleways. Eric Claxton, the lead designer of post-war Stevenage, had believed that use of cycleways would be high if they were well built – originally thinking that Britain’s hostile road environment discouraged people from cycling. Stevenage was compact, and Claxton assumed the provision of 12 ft-wide cycleways and 7 ft-wide pavements would encourage residents to walk and cycle. He had witnessed the high usage of Dutch cycleways, and he believed the same could be achieved in the UK. But to Claxton’s puzzlement and eventual horror, residents of Stevenage chose to drive – even for journeys of two miles or less. Stevenage’s 1949 masterplan projected that 40% of the town’s residents would cycle each day, and just 16% would drive. The opposite happened. Stevenage’s 2010 master plan complained that just 2.9% of the Stevenage population cycled to work, which was “much lower than might be expected given the level of infrastructure provision”. 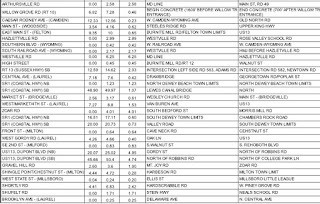 The borough council’s cycle strategy – not updated since 2002 – conveys no doubt as to why cycle usage is so low: “Stevenage has a fast, high-capacity road system, which makes it easy to make journeys by car." There are safe cycle routes from homes to schools, but today only a tiny proportion of Stevenage’s children cycle each day. Many are ferried to school by car, a situation that Claxton abhorred. Despite all the best efforts of a chief designer with empathy for would-be cyclists, “build it and they will come” failed for people on bikes in Stevenage but worked for people in cars." As long as driving remains cheap and easy, bicycling as a significant mode share will forever stay in the realm of fantasy. And even then, pump prices are exponentially higher in England than the U.S., where this lovely pathway network has been all but abandoned. 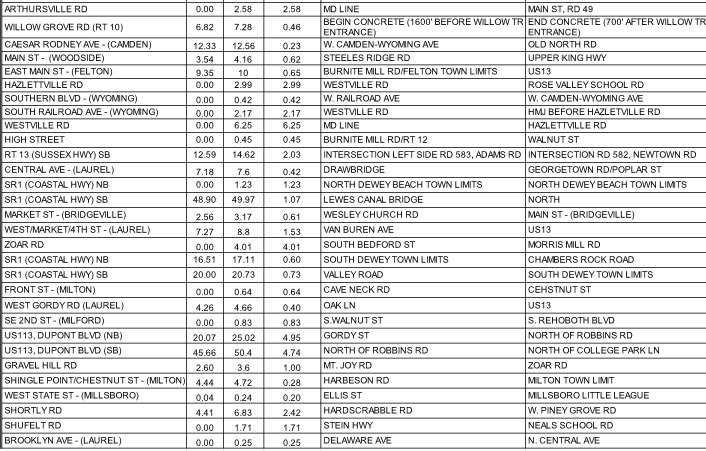 Our case has been, and always will be that Advocates whose sole focus is on costly separated facilities -- as opposed to pragmatism -- are driving the divide that prevents a united bicycling advocacy front in Delaware. Read the full article. Check out the Facebook page "Pragmatic Bicycle Drivers", where pragmatism in bicycling advocacy lives. The State of Delaware has made great strides when it comes to funding some key, albeit isolated trails and pathways projects. And DelDOT is doing a wonderful job incorporating safety enhancements (crosswalks, bike lane/shared lane treatments, signage, etc) with reconstruction and pave & rehab projects. Unfortunately, there are few such multi-modal considerations in New Castle County's Unified Development Code (UDC). And with a State level advocacy organization that won't place any emphasis on retrofitting the built environment, expect little in the way of reduced auto dependency. It's an easy conclusion to draw, not only based on the Code itself, but in dealing with the evidence time and time again when attempting to walk or bike. Probably the most glaring UDC deficiency is found in the retrofitting or reconstruction of existing structures. Essentially, a building and its property is only bound by rules set forth on the day of its first recorded plan; more recent requirements can be disqualified, unless the project expands the building by least 1,000 square feet. 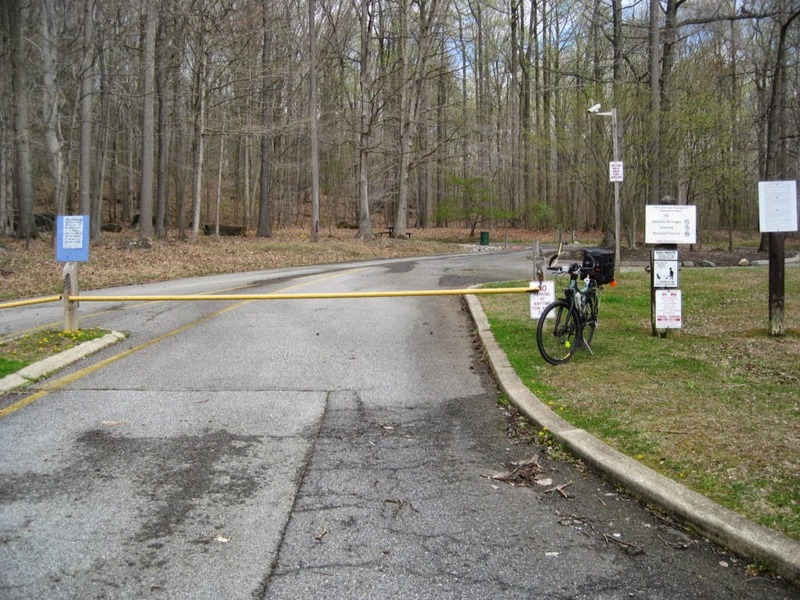 Examples of items added to the UDC over the years include the ADA (American Disabilities Act, 1990) and bicycle accommodations in the form of a parking rack and an entrance bike lane (1997). The fact that so many (if not most) projects are the reconstruction of older buildings seems to explain why these requirements are commonly waived. The redevelopment of a site pursuant to Subsection B.6 permits the continuation of certain nonconforming situations, but prohibits the creation of any new nonconformity or the expansion of an existing nonconformity. 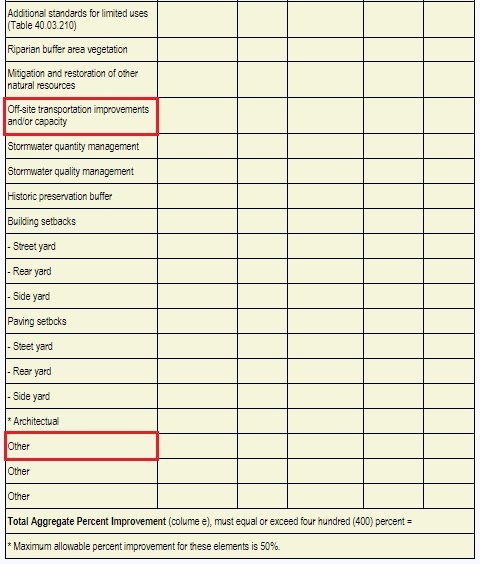 Improvements toward further code compliance shall be made to design elements such as, but not limited to, parking, buffers, landscaping, access, setbacks, storm water management, impervious cover, off-site transportation improvements/capacity, or mitigation of damage to or enhanced protection for existing natural/environmental resources. The exploratory sketch plan shall identify and quantify all of the existing non-conformities on a property. The property owner must propose improvements in selected design elements listed [below], such that in totaling the individual design element improvements, the aggregate shall be equal to or greater than a four hundred (400) percent improvement. So what we have in New Castle County is multi-modal (including handicapped) access and improvements put squarely in the hands of the business and/or property owner. 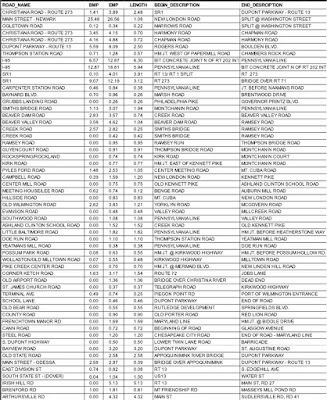 They can omit these in favor of dozens of other choices, as long as it meets this "400% improvement" matrix, however that's determined. And the problem isn't just limited to reconstruction; missing code requirements are sometimes found on brand new buildings. Regardless, it is extremely difficult - if not impossible - to enforce the UDC after a Certificate of Occupancy has been issued. Obviously, the better odds would come with missing ADA facilities, given the far greater profile of handicap access, as opposed to bike/ped access in general. 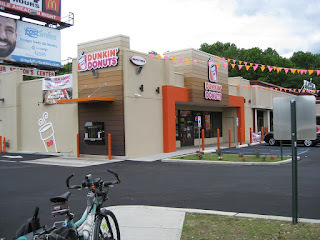 This new Dunkin Donuts in Glasgow is the retrofit of an older building, and thus exempt from critical multi-modal requirements. 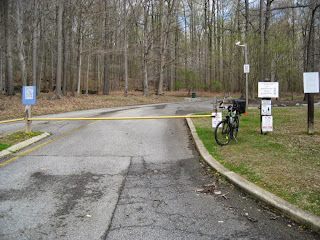 Among them is no bicycle parking, and high curbs (instead of ramps with truncated domes) to connect an adjacent bike path facility that parallels Route 896. Another serious fault with NCC is their use of gates or hanging chains or cables across roads, driveways and trails to block cars. This often forces foot or bicycle traffic (legal in most cases) to circumvent over curbs or via ditches or culverts. They should be using bollards. The required bike lane was waived for the newly reconstructed Shop Rite in Glasgow, despite other improvements that were called for en-route to the magic "400%" required in the UDC. 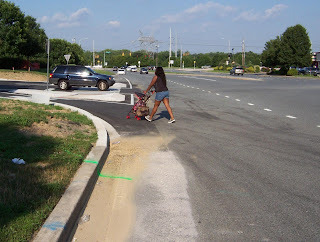 These included new curbing, islands and crosswalk at the main entrance from 4-Seasons Parkway. "New bicycle parking usually accompanies new or expanded car parking, since existing parking areas were built from older plans. There has been some resistance to providing bicycle parking, perhaps based on an idea that it won’t be used. And sometimes existing bicycle parking goes unused, with bicycles instead locked to posts and trees." "Enhancements of County Code may be possible, to more thoughtfully provide bicycle parking with subdivision and land development plans. 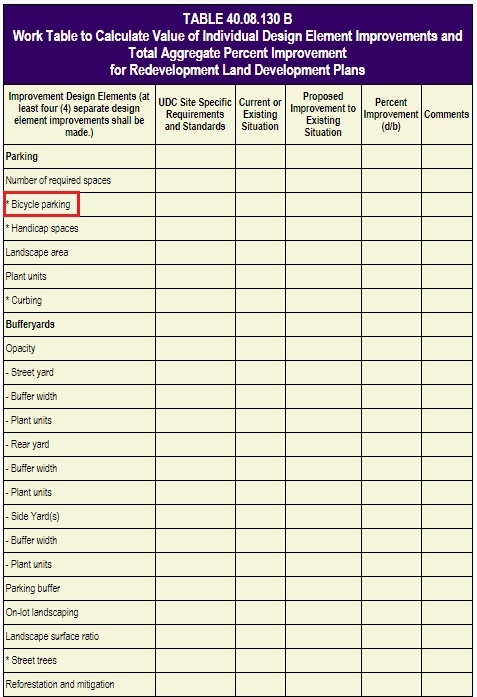 For example, the current flat requirement for bicycle parking might be replaced with requirements for specific land uses such as non-automotive commercial, offices, and apartments. The Code might also suggest preferred types of bicycle parking, and require fastening them down so they don’t disappear." It is a foregone conclusion that if folks are dissing bicycle parking in favor of trees or posts, then the rack is either unsafe to use, hidden from view, or inconveniently located. In any case, if the same thinking was applied to handicapped car parking spots -- that in many cases appear underutilized or never used -- they too would be poorly placed, reduced in size and potentially damaging to vehicles. In conclusion, the need for multi-modal improvements at the county level is a very underrated and all but forgotten area of bicycling advocacy. If we are to have any chance at all of reducing auto dependency, we need code reforms that encourage alternate transportation modes at all levels of building and property development.